On sale now – the murderous Mastock and three Killers. Edward ‘Mad Dog’ Mastock is a scarred psychopathic killer who has escaped maximum security imprisonment in the Tower of London and is now murdering his way across Paris. A sneaky but ferocious killer of innocents, this ragged terrorist nurses a particular grudge against LeBrock. These identically dressed killers are in the pay of a secret cabal of France’s elite. They are nasty cold hearted thugs, armed and happy to shoot anyone they are paid to. They prefer to hunt in packs, but are still no match for LeBrock and Ratzi. These models come with the heads separate, for extra posing options. You can buy them now from our store page, or from Crooked Dice. 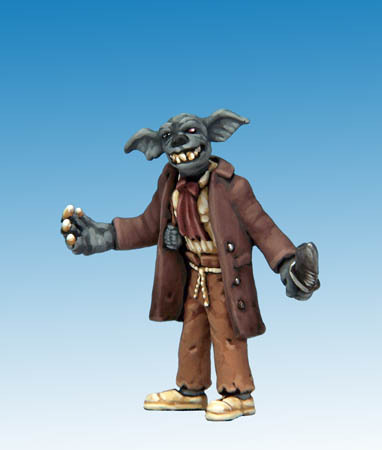 This entry was posted in News and tagged 28mm, Bryan Talbot, Figures, Grandville, Killers, Mastock, Miniatures, Models, Steampunk, Wargame on April 4, 2014 by Helena.